The No. 4 Nebraska volleyball team began the Husker Invite with an efficient sweep of Central Michigan on Friday, 25-18, 25-15, 25-11, at the Bob Devaney Sports Center. Foecke, Sweet and Stivrins combined for 25 of the Huskers’ 34 kills on .458 hitting. Nicklin Hames had 24 assists and seven digs with a pair of aces. Callie Schwarzenbach led all players with five blocks and chipped in four kills. 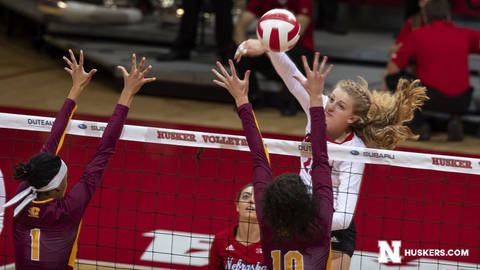 Hayley Densberger served three of the Huskers’ eight aces. She and Kenzie Maloney each had seven digs.